Fireballs: Bright meteors, real and faked. This is at least as real as some of what you’ll see in this article. Photo by Not An Exact Science Show, used by permission. The Earth is not exactly alone in space. Besides all the other planets, moons, and other interplanetary wanderers, space is littered with cosmic detritus: bits of rock, ice, and metal. We plow through about 100 tons of such material a day, the vast majority of which burns up in our atmosphere, producing meteors. This stuff is pretty small, usually far smaller than a grain of sand. But every now and again something bigger gets in our way. On Monday around 8:25 p.m. local time, a chunk of rock (or possibly cometary ice) probably about the size of a basketball burned up over Georgia and Alabama, producing quite a light show. It penetrated down to about 40 kilometers (25 miles) above the surface—pretty far down for something its size—so it also generated shock waves audible from the ground. The American Meteor Society has more info on the event. This was no Chelyabinsk, but impacts like that are (thankfully) rare. Something the size of the Alabama meteoroid (what we call the actual debris) is far more common, happening probably somewhere over the Earth every week or so. I found something odd about this, though: A lot of sites (like here and here; more can be found easily) have a different video of this than the one above, and if you look in the bottom left of the video, there’s a time-date stamp. It says “20110828” … or Aug. 28, 2011! There was a bright meteor that night two years ago, so I think people are running old footage, thinking it’s from the recent fireball. It may be that someone posted it, and then others grabbed the footage without checking to see if it was this event. Three things struck me right away. 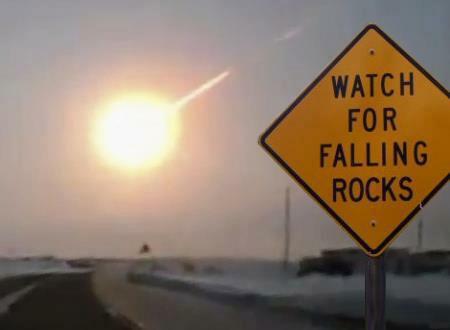 First, the camera operator happened to be pointed at just the right part of the sky where the meteor streaks into view. Look at the speed of the object; they had perhaps one or two seconds before it came out from behind that building. That seems unlikely, to say the least. Second, there were lots of people with their cameras up, but no other footage has surfaced from that location. And third, with all those people, where were the voices yelling excitedly? More footage from other locations turned up, but it looks pretty much the same. Oddly enough, just like the first video, the camera operator apparently just happened to be pointing in just the right place to catch the meteor. Hmmmm. Also suspiciously, no credible site reported on this, despite the dramatic footage. My badastronomy alarm bells were ringing louder. Then I found a thread on Reddit (note: NSFW language) that linked to a video claiming the footage was false. I can’t say for sure how good that analysis is, but it makes some salient points; the “meteor” appears to start and stop, appear and disappear, and so on. Finally, the website Lunar Meteorite Hunters (the veracity of which I cannot confirm) claims the footage is faked as well. While that’s all rather circumstantial, a fireball that bright is extremely rare, and footage this good not getting a huge amount of press seems very unlikely. So I am very skeptical indeed. My opinion is that this is faked. What a week! I wrote about a faked asteroid impact that might’ve been more faked than I thought, a real meteor that has the wrong footage, and a faked meteor that looks the most real of all.